Now you can send us your company logo and we will integrate it into your carton labels when we ship your customer’s packages! 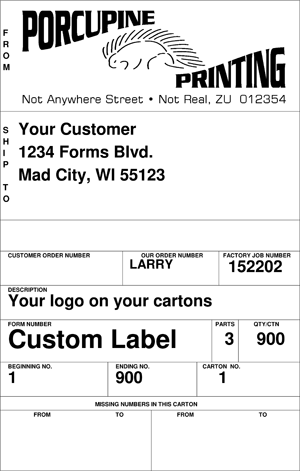 Just send us your company logo and it will be integrated into our custom carton label software anytime you place an order with Madison Forms. Just another way we try to cater to our customers’ needs. See an example custom carton label by the image on the left! Please put a note in the message field stating that this is for your custom carton labels, and state your company name. Thanks!